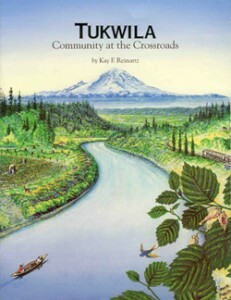 The history book Tukwila, Community at the Crossroads was published in 1991. The author, Dr. Kay F. Reinartz, is an active cultural historian who made wide use of community participation while writing this book. It covers the rich history of Tukwila beginning from the earliest settlers in the Valley up through 1990. Contained in this book are archival photographs, historical diaries, official records, and personal memoirs. The Mayor of Tukwila, along with the City Council, gave their enthusiastic support during its formation. Volunteers, local historians, and Tukwila citizens (both past and present) worked many hours compiling information to be used in Tukwila, Community at the Crossroads. Tukwila’s History Book, Tukwila, Community at the Crossroads is available for purchase at City Hall, 206 433-1800. The cost is $10.00 (plus sales tax); mail orders are approximately $13.00 each. This book is also available at the local libraries in Tukwila: Foster Library and Southcenter Library.